Review for Effortless Conversation System, Bargain. A Collection of Quality Conversation and Other Advice for $5.95. "Bargain. A Collection of Quality Conversation and Other Advice for $5.95." Great value for money. A solid collection of 'tried and tested' tips from the world of pickup artistry. Doesn't go deep enough into practical details in places, lacks examples to make clearer. Not suitable for beginners without prior knowledge of systems like Mystery Method. For $5.95 this is a great deal. It's a stash of solid techniques vetted by experience that even experienced men will be able to take to improve their game. If you are specifically interested in improving your 'conversation skills', I recommend that you get this course with "The Effortless Conversation Accelerator Pack" upgrade which includes "Secrets of 5 Minute Chemistry". 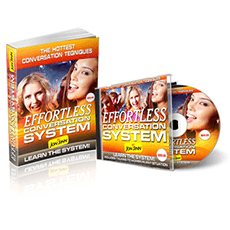 That will give you a full functioning conversation skills course at a very reasonable price, whereas on its own, the Effortless Conversation System, is a lot less comprehensive. This is an interesting package of mini-courses at a very low price ($5.95). While the name of the package is the "Effortless Conversation System", the fact is that the 3 bonuses that come with this course (Secrets of Sexual Attraction, How to Date Out of Your League and Turning Friends into Lovers) are each nearly as substantial as the Effortless Conversation System course itself. So in this review, it's worth me covering each of these courses separately. Each of the 4 courses is given to you in video format where you have Jon Sinn talking you through some slides that he's prepared on each subject. All in, you get 120 minutes of video training. For the Effortless Conversation System, you also get the transcription of the video as an eBook. The main course in this package features an hour long video training covering a good set of 'high impact' topics such as why men run out of things to say and what to do to get round it, how to create chemistry and deep rapport with women, typical social errors relating to conversation made with dating systems like Mystery Method and other items. The course starts off well, with Sinn introducing some useful concepts in social dynamics (not just for use with women, but also generally) and giving you a tour around the connection between conversation and comfort. He goes into a fair amount of detail, so these early topics should be easy for anyone to grasp. Some solid practical material everyone can benefit from is where he digs into how to use and not use questions, transitions and statements. It's down to earth but goal orientated advice that will give you a clear understanding of when to use what so it actually helps the conversation flow. As you get into the course, Sinn puts less effort into the examples, and details, for each topic. To be fair, there are a lot of topics covered in the hour. If you are more experienced you may understand everything straight off, but as the material gets more rushed, it does get less clear. For complete beginners it won't be as easy to assimilate and put into practice the advice properly. Solid first half with lots of concrete material to get your conversations smoother and working for you, rather than against you… second half, starts to become a bit of a blur of topics as they are run through quicker. I noticed that on the whole, the "effortless conversation system" is actually a cut down version of Jon Sinn's earlier course "Secrets of 5 Minute Chemistry" that I reviewed recently. It covers many of the topics, but not all that are covered in 5 Minute Chemistry, and doesn't go into as much practical detail. There are a few parts of Effortless Conversation System where Jon goes into more detail on a topic that was slightly less covered in 5 Minute Chemistry. But on the whole, you should look at 5 Minute Chemistry as the complete course, while this is like a cut down version of it. If what you need is to improve your conversation skills and in particular you have an issue with 'running out of things to say' when you're talking to women, I'd recommend that you get the 5 Minute Chemistry as it will get the job done better. However, right now Sinns of Attraction are offering an upgrade to the Effortless Conversation System named "The Effortless Conversation Accelerator Pack" which includes 5 Minute Chemistry as well as another course, at a discounted price. So check out our review for 5 Minute Chemistry Secrets of 5 Minute Chemistry to see if it's what you need, and if it is - you're better off going through the purchase process for Effortless Conversation System and ticking the "Effortless Conversation Accelerator Pack" upgrade when you see it. You'll save $16 and get the additional 3 bonus courses with this package, that as you'll see below are pretty good in themselves. This course is a mix of effective techniques that Sinn has collected over time for sexual attraction from his own discoveries and what he has learnt from others over the years. Sexual attraction is best used with girls that are more feisty and confident in their sexuality, or in a relationship to spice things up. You also need some confidence to pull them off, as you may get tested on some of them, so be aware of that and take it easy if you're less experienced, introducing one or two at a time. For the most part, the techniques are pretty self explanatory and you should be able to implement and insert them into your 'game' as needed. However, this will vary depending on your experience with existing pick up artist material. There were a couple of items that needed more explanation to be implemented - the main one was the use of sexual facial gestures, which really needs to be shown to you for you to do it yourself. Some of the tips in this course are old skool PUA techniques from over 10 years ago that I haven't seen written down in a product before. It's actually really nice to see them here, as they are great for turning up the vibe of the interaction and it was about time someone shared this useful knowledge. What I liked about the How to Date out of Your League video is that it's realistic advice. It doesn't make it sound easy, it gives you the 'bad news' to your face. Which at the end of the day is the best advice you're going to get. Telling you something you'd like to hear, would waste your time. This course is about how to date women that are a lot more physically attractive than you or more social or otherwise better positioned than you. It goes through several aspects of 'game' and your life in general that you need to work on to get yourself into a position where you can more easily date these kinds of women. There is some very straightforward advice here about strategies you can take, which involve changing big things in your life and investing a lot of effort over time into a new lifestyle. The approach you probably want to take to this material is to read through it and think about which areas you are motivated to integrate into your life long term and how. In a way, the value in this course is that it can potentially open your eyes to some longer term lifestyle options you hadn't thought of. Then you can decide if the benefits of better access to more attractive women are worth it for you to invest in making one of these happen. Otherwise, it's also useful to men who want to understand social dynamics a bit better. If you think you're not really up to speed on how social dynamics and hierarchy work it will give you some much clearer ideas, so that you make more accurate observations of what you see in your life. This is one of the shorter bonus courses at around 15 minutes of video. Let's clarify what this course is for, because there could be some confusion. It's for converting a "real friend" that is a girl into a lover. If you're not sure if a girl you have in mind is a friend, ask yourself whether you hang out with her every week and stay in touch regularly? Or if she was a guy, would you call her a friend. This course wasn't designed to help you with girls that have told you "let's just be friends" when you aren't really close friends already. The material in this course is interesting and kind of devious. It basically explains a 3 step process on how to set up a situation between you and a girl friend, that will change the dynamic between you. She will look at you differently, and importantly the 'respect' she will have for you will change significantly. What happens after the situation is set up is not given to you. Sinn would need to go into more detail of what you'd have to do afterwards to make this a more useful course. While he tells you how to set the dynamic up with a girl, he doesn't emphasize that you need to run with it afterwards or go into details of how you can take it from there and push it to the end result. Without going through what happens on the backend, I think most guys unless really experienced would drop the ball later with it and not get results. Also keep in mind that, even if you run with the situation and make it work, it wouldn't be sufficient to convert a friend into a lover. You'd need to run the usual attraction game. So look at it this way. If you have good game, and are experienced, and you add this strategy I could see it working. If you're inexperienced, you'd have to get your whole game up to speed before you'd get results from it. Caveat here: I've never tried to turn a friend into a lover, so I'm not basing my opinion of this bonus course on completely direct experience. However, I have naturally go into the situation that Sinn describes as your 'goal' and gateway to becoming a lover with a friend. In my case this has occurred naturally with some girl friends and some ex girlfriends over the years. So I do understand exactly the type of dynamic he is describing. In my experience, these girls have not looked at me as a lover. Since I've never been interested in doing that, I'll never know for sure. As a general comment, something you should be aware of is that Sinn's courses tend to assume you know a lot of the basics of Mystery Method and pick up artistry. This is typical of his programs, and perhaps even more so for this program. What does that mean? If you're a complete beginner you may get a little lost and need to look up additional material. More concretely, there are times where he'll talk about themes like testing, attraction or aspects of Mystery Method and not introduce you completely to the topic. You're expected to understand the basics already, and he is giving you information and advice to modify or improve upon what you know. In other places he will introduce new ways of using old techniques - so you really do have to have some basic skills already. This is less the case for the Effortless Conversation System, which on the whole could be used by relative beginners, and more the case for the 3 bonus video courses. So to make use of the bonus courses you may have to do some extra homework outside of these courses. Another factor that makes this course less appropriate for complete beginners is that there are also not a lot of examples given, just a few here and there. More examples would have made everything clearer and made it easier to put the techniques into action for you. Non-beginners would have also benefited a lot from having more examples. Lack of examples is the main weakness of this product. For $5.95 this is as you may have guessed a 'no brainer' to buy. Guys who have a bit of experience, will get a lot of tried and tested tips for improving several aspects of their game. Even if you're advanced you'll find some gems. If you are most interested in improving your 'conversation skills', the most effective course is "Secrets of 5 Minute Chemistry". You can get that as an upgrade to this system named "The Effortless Conversation Accelerator Pack". That will give you a full functioning conversation skills course, whereas on its own, the Effortless Conversation System, is a lot less complete.